QGIS provee varias utilidades para desarrollar con Python. Sin embargo, si se quiere construir una aplicación independiente con PyQGIS se deben crear algunos controles como la tabla de contenido, un control imprescindible en una aplicación SIG. A continuación comparto una. Nota: For the English version click here. He creado un control para aplicaciones basadas en PyQGIS que es una versión muy simplificada con relación a la tabla de contenido de QGIS. La principal diferencia es que la mía no maneja grupos de capas. El control está basado también en la leyenda de OpenOceanMap, escrita por Aaron Racicot, pero en lugar de trabajar con controles QCheckBox, utiliza QTreeWidgetItem para representar cada capa del mapa. Qué permite esta tabla de contenido? Obtener un listado ordenado de capas. Mover capas hacia arriba o hacia abajo en el listado para modificar el orden de despliegue en el mapa. Hacer una capa visible o no visible. Visualizar/cambiar la simbología de la capa (se da un ejemplo muy básico cambiando únicamente el color de la capa). Cambiar algunas propiedades de la capa. 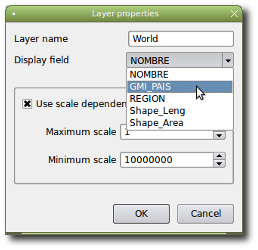 Cargar/Guardar archivos de estilo de QGIS (.qml). Integrar el mapa con otras herramientas que actúan sobre las capas cargadas (por ejemplo, Mostrar/Ocultar/Remover todas las capas). Cuál es la licencia de esta tabla de contenido? La licencia es GNU GPL v.2. Como agrego la tabla de contenido a mi aplicación de PyQGIS? 1. Descargar este archivo ZIP y extraer su contenido en la carpeta de la aplicación. El archivo contiene el archivo legend.py, el cual contiene la definición de la tabla de contenido, varias imágenes (íconos) para representar los tipos de capas y las opciones del menú, y finalmente, un diálogo que es usado para definir algunas propiedades de las capas. Los íconos pueden obtenerse desde este enlace, puesto que son del proyecto QGIS. 2. Importar la clase Legend. 3. Agregar el método CreateLegendWidget.
""" Create the map legend widget and associate to the canvas """
4. Compilar/Importar un archivo de recursos para incluir los íconos. El archivo legend.py contiene una referencia al archivo generado. Sin embargo, si se tiene un archivo de recursos previo, es posible agregar las imágenes de la carpeta imgs a un nuevo prefijo, por ejemplo, "legend". Si se quiere elegir otro prefijo se debe modificar la variable resource_prefix del archivo legend.py. 5. Permitir que la tabla de contenido administre las capas cargadas y removidas para evitar fallos de segmentación. La aplicación debe tener un método para cargar capas, pero ahora que se busca incluir una tabla de contenido, es esta la que manejará esta funcionalidad. La tabla de contenido tiene un SLOT para manejar el conjunto de capas (layer set) en el momento en que se carga, se mueve o se remueve una capa. Lo que se debe hacer es llamar los métodos apropiados (bien sea addMapLayer o removeMapLayer) de la instancia del singleton QgsMapLayerRegistry, pero no emplear el método setLayerSet del canvas, puesto que la tabla de contenido lo hará. Entonces, se deben comentar o borrar los llamados al método setLayerSet. 6. Cargar el diálogo de propiedades. Para permitir que el usuario defina algunas propiedades de las capas se debe compilar el archivo dlgLayerProperties.ui, el cual provee un diálogo básico. Read 102768 times	| Like this? Tweet it to your followers! I'm developping a Python application and i'm using your devs. Great job! I get some trouble with vectorLayerSymb ology method:it seems that the renderer is not convenient. Do you have any idea to fix it? The problem you have now is related to this legend's lack of support for symbology-ng (new generation) in QGIS. You can replace the functions of this file  (in legend.py) to have single symbology-ng working, but not categorized nor graduated I guess. Most of the functionality in this legend is adapted from  (in C++), so if you can deal with a bit of C++ code and adapt it to Python, please let me know, we could work enabling this legend to support symbology-ng. In that case I would set up a SVN repository for the code. During last days I’ve found a solution looking into cpp code. Now it works. But I think code is not realy clean (I’m a Python newby !) The next step for me : legend group ! The first question is : create a new class Legendgroup like LegendItem or as a subclass of legendItem ? I look at C++ and try to "translate" into Python. Please consider sharing your work. In QGis when you check on or off a layer, only these one is redraw not all other. That’s not the legend.py behaviour now. What should be the best way to do this inside legend.py? Congratulations for your plugin. It is very useful for me. But I have a doubt related with more than one layer added and their visualization in map canvas. I had one layer and it is every ok (I didn't use all the properties of the plugin). But when I add a new layer, this opens in my map canvas and the first one disappear. So in the legend I have two layers and only one in map canvas. I just want you to explain which funtion deals with this and if I have to do something else in my main code. Hope that you helps me. Thank you. thanks! You don't need this component anymore, because QGIS (thanks to Martin Dobias) now gives us a Layer Tree View, have a look at: http://bit.ly/1GJlVkN and tell me if there is something unclear to you. thank you so much for the answer. I try and I get it!! Now my layers are in correct order. But I miss other widgets that I would like to have in my application. For example, the possibility of zoom extent and to remove the layer (by clicking with the right button of the mouse in the layer, as actions). This actions belongs to legend.py but know I am not able to do that. Can you help please? please have a look at the documentation of the QgsLayerTreeVie w , specifically at the bullet point "Display of context menu." You'll find there indications on how to implement your own context menu, as well as an example. Please give it a try; if I remember well, when I gave it a try it didn't work for me. If that's the case also for you, we could file a ticket reporting the issue. It works!!! :) Thank you so much, it was very very useful this help. Glad you found it useful, Barbara. BTW, we publish tips like this in our Twitter account: twitter.com/GeoTux2 Follow us there!